On a routine mission to PJ6-877, the SG-1 team is captured by Aris Boch, an alien bounty hunter. Boch's true objective is a Goa'uld named Kel'tar, who is wanted by Sokar, and Boch offers the team their freedom in exchange for their help. SG-1 reluctantly cooperates, but when they capture Kel'tar, they learn that he is not a Goa'uld at all. He is a Tok'ra spy named Korra, and he will be tortured by Sokar for information. Boch is unsympathetic, but SG-1's refusal to risk more Tok'ra lives by turning over Korra, eventually brings about a change of heart. 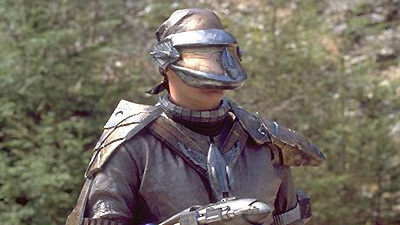 Aris Boch is one of the greatest bounty hunters in the galaxy. When Goa'uld invaded his home planet, they discovered that his race physically rejects the Goa'uld and can't be used as hosts. As a result, the Goa'uld killed most of the population, leaving the youngest as slaves and addicting them to the substance roshna, which keeps them subservient, and without which they will die. Boch said that his wife was killed, his son is a slave in Sokar's naquadah mines, he was sent to capture the Goa'uld Kel'tar for plotting against Sokar, and he trades in order to free himself and his son. In fact, he has no wife or son, is hunting Korra, a Tok'ra operative, and trades for the roshna he needs. Korra was a spy in Sokar's ranks, but believed he had been discovered, and escaped in the cargo ship to the planet where Aris Boch was waiting for him. Sokar's Goa'uld cargo ship uses a cloaking device. Aris Boch is not affected by a zat gun. The voice activated command for opening the cargo ship is "Barokna". Tacluchnatagamuntoron, or "tac," is a Goa'uld automatic remote weapon. Um... Almond bark, Barca Lounger, Beetlejuice!